Fritters, pies, ciders and compote. Tossed in cinnamon, placed near pork chops, and crushed into sauce. Sliced, turned over, and juiced. Long before it was a symbol for the communication age or the collective nickname for the Five Burroughs, the venerable and versital apple was a mainstay on the North American table and sign of all things autumn. As the leaves give up their lofty perches and make the turn from hanging ornament to crunchy ground cover, and the crack of the back gives way to the crack of the helmet, annual apple harvests, and their subsequent festivals, begin to pop up around the continent. 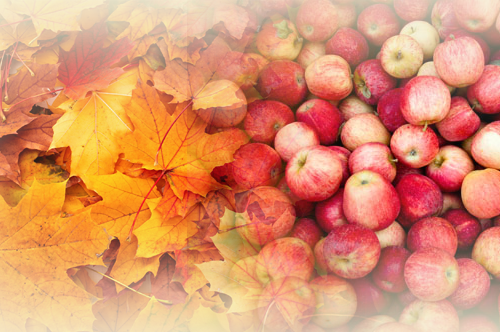 In the U.S., some 7,500 apple growers pick around 250 million bushels of apples. While this fruit is plucked from trees between September and November – depending on the variety – apple lovers consume them throughout the year. Protecting such a huge crop for yearlong consumption is no easy task. Temperature, humidity, carbon dioxide and oxygen join forces to destroy the fruit as soon as it is removed from the tree. Around the time of World War II, apple growers noted that fruit stored in a sealed room had a longer shelf life than that left in the open. It turns out that apples, as they sit in storage and their fruit turns to sugar, give off carbon dioxide and take in oxygen. This gas exchanged reduced the total O2 level in a sealed room, slowing down their march towards ripeness. Over the decades the complexity of this process, now called controlled atmosphere storage (CA), has increased greatly. Sensors in sealed rooms monitor the environment, maintaining optimal levels of oxygen, carbon dioxide, humidity, and temperature. To help control oxygen and moisture levels, a dry, non-reactive gas is periodically added to the atmosphere. Typically nitrogen, the gas replaces O2 to a set parameter. Having enough nitrogen gas in storage to purge several large storage rooms can be a challenge. This is why many producers have turned to nitrogen generators to supply their needs. Unlike delivered nitrogen which is shipped in by a local gas company, a nitrogen generator creates a supply of gas on demand. As conditions change in the sealed room and more N2 is needed, an integrated nitrogen generator kicks on, producing what is needed. The simplicity of a nitrogen generator is its greatest asset for apple producers. The system, which takes in a supply of compressed air and separates the N2 from the O2, requires very little maintenance and oversight. This is important for facilities that require their fruit to be stored for up to a year. The delicate matter of maintaining the perfect conditions of a well-designed CA facility requires knowledge of each component. When working with a nitrogen generator specialist, it is important to find someone who has experience sizing and designing systems. The team at Compressed Gas Technologies have been working with food producers and manufacturers for more than a decade. So through the technology of CA and the production of nitrogen, you could be enjoying a juicy Gala apple that was plucked from the tree during last year’s harvest. And it will be as crisp and fresh as the day it was picked. How do you like them apples?